Sargassum cristaefolium; Cakaulevu Reef Plants. 09 Dec 2004. Peter Skelton. © ORDA and Peter Skelton (skeltonp@bigpond.net.au) and Peter Skelton (skeltonp@bigpond.net.au). According to Silva et al. 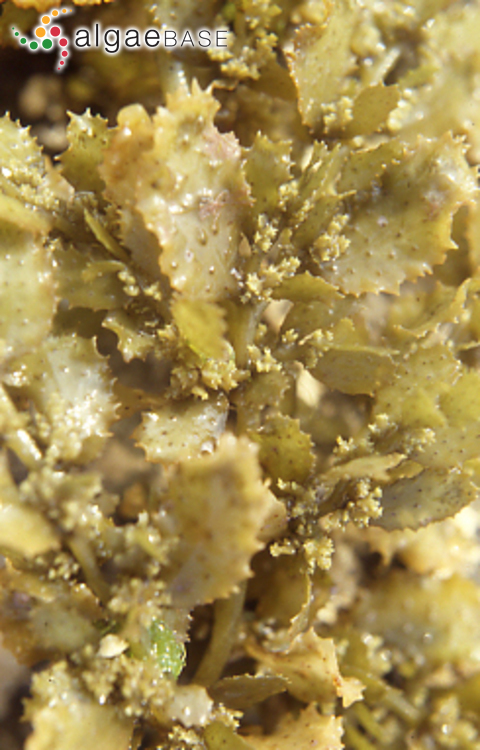 (1996), the name Sargassum ilicifolium was misapplied to this species by Harvey (1857a: no. 103) and they recommend consulting J. Agardh (1889: 91). According to Silva et al. 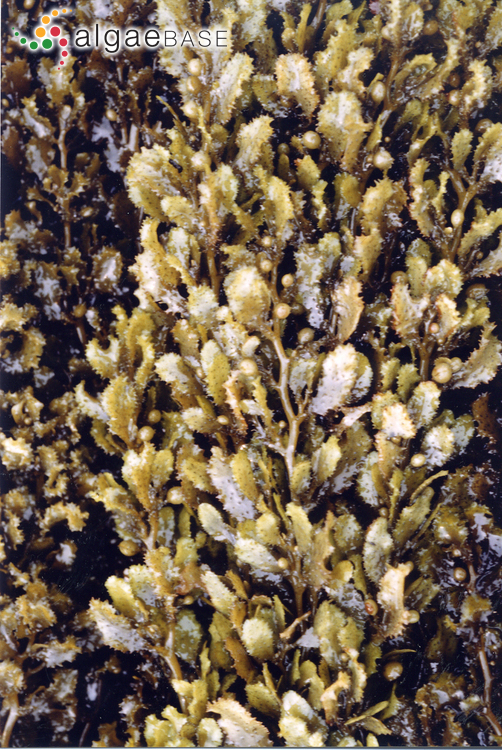 (1996), the taxa Sargassum duplicatum var. rotundatum and Sargassum duplicatum [var. rotundatum] forma dubium apparently lie within the circumspection of this species but have not yet been transferred or reduced to synonymy. Type locality: Unknown (Silva, Basson & Moe 1996: 665). Holotype: LD (Ajisaka et al.1997: 34). Notes: Type. From unknown locality (from Retzius, in LD). C.Agardh (1824) gives Ceylon (Womersely & Bailey, 1970). Africa: Kenya (Silva, Basson & Moe 1996, Bolton, Oyieke & Gwanda 2007), Madagascar (Silva, Basson & Moe 1996), Mauritius (Silva, Basson & Moe 1996), Somalia (Silva, Basson & Moe 1996), Tanzania (incl. Zanzibar) (Silva, Basson & Moe 1996, Oliveira, Österlund & Mtolera 2005). Indian Ocean Islands: Andaman Islands (Silva, Basson & Moe 1996), Comoros and Mayotte (Silva, Basson & Moe 1996), Laccadive Islands (Silva, Basson & Moe 1996), Nicobar Islands (Silva, Basson & Moe 1996), Réunion (Silva, Basson & Moe 1996), Rodrigues Island (De Clerck et al. 2004), Seychelles (Silva, Basson & Moe 1996). South-west Asia: Bangladesh (Ahmed et al. 2009), India (Silva, Basson & Moe 1996, Sahoo et al. 2001), Oman (Silva, Basson & Moe 1996, Wynne 2018), Sri Lanka (Børgesen 1936, Silva, Basson & Moe 1996), Yemen (Silva, Basson & Moe 1996). Asia: China (Tseng & Lu Baoren 1997, Tseng & Lu 2000, Liu 2008), Japan (Okamura 1936, Yoshida 1988, Yoshida, Nakajima & Nakata 1990, Phillips 1995, Yoshida 1998), South China Sea (Phang et al. 2016), Taiwan (Lewis & Norris 1987, Yoshida 1988, Huang 2000, Shao 2003-2014, Anon. 2012, Anon. 2012). South-east Asia: Indonesia (Verheij & Prud'homme van Reine 1993, Phillips 1995, Silva, Basson & Moe 1996), Malaysia (Phillips 1995, Silva, Basson & Moe 1996), Myanmar (Burma) (Soe-Htun et al. 2009), Philippines (Silva, Meñez & Moe 1987, Trono 1992, Phillips 1995), Singapore (Silva, Basson & Moe 1996), Vietnam (Pham-Hoàng 1969, Dai 2007). Australia and New Zealand: New Zealand (Adams 1994, Harper et al. 2012), Papua New Guinea (Littler & Littler 2003), Queensland (Lewis 1985, Phillips 1997, Phillips 2002, Bostock & Holland 2010). Pacific Islands: Federated States of Micronesia (Tsuda 1988, Phillips 1995, Lobban & Tsuda 2003, Lobban & Tsuda 2003, Tsuda 2006), Fiji (Phillips 1995, N'Yeurt, South & Keats 1996, South & Skelton 2003), Guam (Lobban & Tsuda 2003), Mariana Islands (Tsuda 2003), New Caledonia (Payri 2007), Solomon Islands (Womersley & Bailey 1970, Phillips 1995). Kilar, J.A., Hanisak, M.D. & Yoshida, T. (1992). 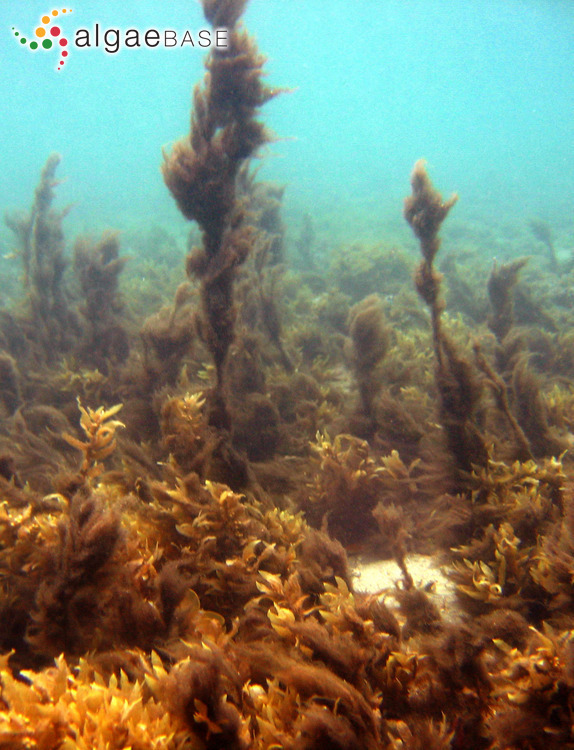 On the expression of phenotypic variability: why is Sargassum so taxonomically difficult?. In: Taxonomy of Economic Seaweeds with reference to Pacific and Western Atlantic species. (Abbott, I.A. Eds) Vol.3, pp. 95-117. La Jolla, California: California Sea Grant College. Accesses: This record has been accessed by users 7309 times since it was created.